Peter Mendelsund is the best and most iconic book cover designer since Alvin Lustig back in the 1940s. Not one of, but THE best. You might not recognize his name but you definitely know his covers. And here is a brilliant little book, gorgeously illustrated, describing his phenomenology of reading, of what happens when we visualize characters and fictional spaces and scenes. This is a book about books by someone who clearly loves books. Accessible, whimsical, and erudite all wrapped in one well-designed package. A gorgeously unique, fully illustrated exploration into the phenomenology of reading—how we visualize images from reading works of literature, from one of our very best book jacket designers, himself a passionate reader. What do we see when we read? Did Tolstoy really describe Anna Karenina? Did Melville ever really tell us what, exactly, Ishmael looked like? The collection of fragmented images on a page—a graceful ear there, a stray curl, a hat positioned just so—and other clues and signifiers helps us to create an image of a character. But in fact our sense that we know a character intimately has little to do with our ability to concretely picture our beloved—or reviled—literary figures. 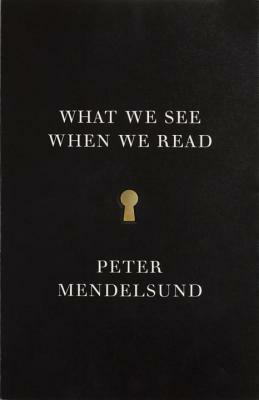 In this remarkable work of nonfiction, Knopf's Associate Art Director Peter Mendelsund combines his profession, as an award-winning designer; his first career, as a classically trained pianist; and his first love, literature—he considers himself first and foremost as a reader—into what is sure to be one of the most provocative and unusual investigations into how we understand the act of reading. Peter Mendelsund is the associate art director of Alfred A. Knopf and a recovering classical pianist. His designs have been described by The Wall Street Journal as being “the most instantly recognizable and iconic book covers in contemporary fiction.” He lives in New York. "Wow. . . . Mendelsund has changed the way I think about reading. Like the Wizard of Oz tornado, Mendelsund's lucid, questing prose and his surprising, joyful visuals collide to create a similar weather system inside the reader. Not only are you carried off to Oz, but you're aware at every moment of the cyclonic action of your reader's mind and your reader's imagination. It's so smart, so totally original, so beautiful. This is the perfect gift for anyone who has ever blinked awake inside a book." —Karen Russell, author of Swamplandia!